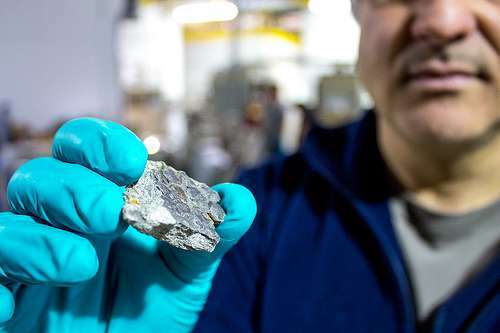 University of Regina physicist Mauricio Barbi and a rare hadrosaur skin sample. University of Regina physicist Mauricio Barbi said the hadrosaur, a duck-billed dinosaur from the Late Cretaceous period (100-65 million years ago), was found close to a river bed near Grande Prairie, Alberta. The area has a robust "bone bed" but Barbi is not yet sure why the fossil preserved so well. "As we excavated the fossil, I thought that we were looking at a skin impression. Then I noticed a piece came off and I realized this is not ordinary – this is real skin. Everyone involved with the excavation was incredibly excited and we started discussing research projects right away." But there are almost more questions than answers, he said. One question is whether the hadrosaur skin was green or grey, like most dinosaurs are portrayed, or was it a completely different colour. Barbi said he can use the CLS to look at unique structures called melanosomes, cellular organelles the contain pigments that control the color of an animal's skin. 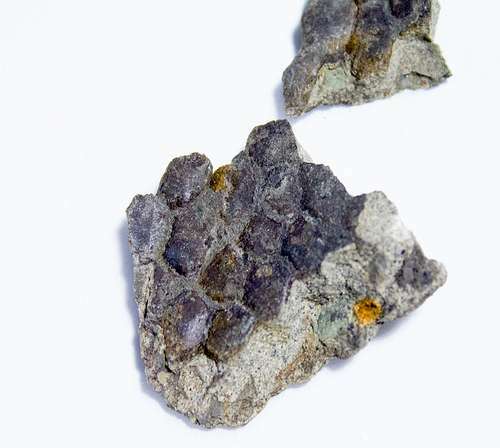 "If we are able to observe the melanosomes and their shape, it will be the first time pigments have been identified in the skin of a dinosaur," said Barbi. "We have no real idea what the skin looks like. Is it green, blue, orange…There has been research that proved the colour of some dinosaur feathers, but never skin." Using light at the CLS mid-infrared (Mid-IR) beamline, Barbi and CLS scientists are also looking for traces of organic and inorganic elements that could help determine the hadrosaur's diet and why the skin sample was preserved almost intact. For the experiment, the sample is placed in the path of the infrared beam and light reflects off of it. During the experiment, chemical bonds of certain compounds will create different vibrations. For example, proteins, sugars and fats still found in the skin will create unique vibrational frequencies that scientists can measure. May said that infrared techniques are so accurate at determining chemical characteristics that it is known as the "fingerprint region" of the light spectrum. "We have no real idea what the skin looks like. Is it green, blue, orange…There has been research that proved the colour of some dinosaur feathers, but never skin."